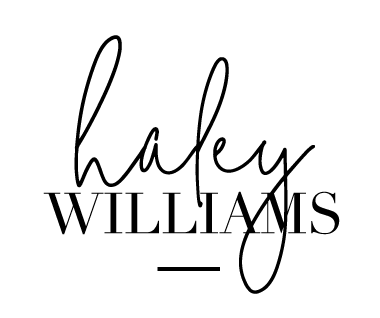 I’M HALEY WILLIAMS, but this isn’t about me. It’s about you. How you’re serving your clients, changing peoples’ lives, and writing a story worth telling. I believe with all my heart that the world needs you to show up big and bold. And I can help you do that. why blend in when yOU WERE CALLED TO STAND UP AND STAND OUT? I already know one thing about you: You want your brand and your website to reflect who you really are. You are tired of the disconnect between your digital brand and real life persona. (And yeah, you wouldn’t mind getting more clients from your website, either). You CAN do big things. Far more than you think. I will help you stop the identity crisis and imitation cycle of stalking your competitors’ websites and trying to figure out what YOURS should be. I’ll help you design and develop a brand and digital footprint that aligns with who you and you only are. YOUR DREAM BRAND REQUIRES BOLD ACTION AND IT STARTS RIGHT HERE. Haley is great at what she does. I like how she takes you through a creative brief to figure out which direction to go with your project. It is very helpful to get your message across and the end product never disappoints. READY TO EDIT IN ADOBE ACROBAT PRO! Need a new business card? Download my free business card design, add in your own logo, name and details and BOOM. Fresh new business card! Got a project in mind? Let’s chat. WE SAVE OUR BEST STUFF FOR EMAIL. JOIN US.